The A-iPower SUA12000E is the first of two generators that we’ll be reviewing. It’s powerful enough to power the house, a construction site or a business during a power outage. Yet it’s portable and can be taken on vacation to remote areas. In this article, we compare the A-iPower SUA12000E to another big generator, the Pulsar PG10000B16. Both are very capable generators that can compete for being the best in this class. We also explain the reason generators are given two ratings, running and starting Watts. What’s more, we’ll discuss a great solution for the noise generated by these machines and the benefits of using LPG as a fuel. When considering a generator, you are confronted by a list of confusing specifications. Two specifications will always be listed, the running Watts and the starting Watts. To some of us it may be obvious what this means but for the benefit of all, I will do a quick introduction. Running Watts refers to the maximum continuous power a generator can supply. Starting Watts refers to the momentary overload it can handle without tripping the supply. The starting Watts is the load beyond the rated continuous running Watts, overloading the generator for a second or less. The A-iPower SUA12000E is rated for 9000W running power, when used at 5000W it still has 4000W in reserve. Using it like that, it can handle all the startup current thrown at it. However, when running continuously at 9000 Watts, it can only rely on the overload reserve. Should a device then start up it needs the ability to be safely overloaded. Without that ability, it will have to trip the power to protect itself. All power tools and power appliances draw more power during startup. Appliances like refrigerators have a maximum inrush current of about 13 amps, which lasts only about half a second. At 120V, 13 Amps = 1560 Watt. Wonderfully designed generator with plenty of high-quality features typically found on more expensive generators. Excellent emergency generator. Easy to set-up. ✓ View or download the MANUAL for the A-iPower SUA12000E. The A-iPower SUA12000E is one of the best generators if you’re looking for a quality generator that won’t break the bank. Designed to provide 9000 Watts of power, it will also comfortably put out 12000 watts for starting electrical devices, which require a higher power load for their initial start. It means you’ll have no problem using the A-iPower SUA12000E at full power (9000W) and it will not trip the current when a fridge starts up. It’s powerful enough to run most average homes during a power outage. The A-iPower SUA12000E can power up lights, an air conditioner, refrigerator, pump, fan and TV, all at the same time. The best way to connect a generator to a house is to use a transfer switch and outside house receptacle. You can read all about doing it safely in our article https://www.chainsawjournal.com/how-to-connect-a-portable-generator-to-a-house/. The A-iPower SUA12000E is fitted with a 120V/240V twist-lock outlet that connects to this type of housing inlet. Combined with a transfer switch, the A-iPower SUA12000E is an ideal power backup solution during outages. The A-iPower SUA12000E is also ideal for weekend getaways and vacations. It will make any camping trip a luxurious outing. One 120/240V RV outlet is provided to connect the A-iPower SUA12000E to the camper. This is a big generator, it weighs 206 pounds. Fortunately, it’s mounted in a rigid tubular steel frame with large 9.5in heavy-duty wheels for moving over rough terrain. It’s equally at home in the bush or on a construction site. Contractors working on site will probably benefit the most from the high peak Wattage of the A-iPower SUA12000E. Just about all power tools require extra Watts to get going and the generator is equipped to support that. There can be nothing more frustrating than having your generator trip out every now and then. That’s when you will really appreciate the extra 3000 Watt startup power. It will power a 1/2″drill, jigsaw, band saw, table saw, circular saw and a chop / cut off saw – all at the same time. The control panel is well equipped and easy to use, designed with your safety in mind. The A-iPower SUA12000E is safe in damp conditions. Its four 120V outlets are GFCI protected to protect you from nasty shocks. A ground fault circuit interrupter (GFCI) is used to reduce the risk of electric shock. It shuts off electric power when it detects a current flowing through water or a person. All the outlets have rubber covers to keep out the dirt and little fingers. Heavy-duty construction. Covered outlets protect them from water & dust. Starting a 460cc generator by pulling on a cord as you would with a chainsaw is not so easy. Elderly folks lose some muscle power and tire easily, so they will really appreciate an electric starter. Women and the young ones are also users and they don’t normally have the muscle power to yank a recoil starter. The A-iPower SUA12000E has electric start and should the battery fail you, there is a recoil starter as a backup. A recoil starter is one of those things you yank. While you pull it, it turns the motor and when you let go the recoil spring pulls it back. That’s why dads are strong. The generator is powered by A-iPower’s 459cc/16hp OHV engine. Our friends in California can use this generator because it’s CARB compliant. That simply means it’s approved for use in California. For those who need a refresher on CARB compliance read our article https://www.chainsawjournal.com/carb-compliant/. The muffler does an adequate job, as can be expected from a quality supplier. Interestingly, the muffler is not the noisy part of a generator motor. Because the engine is air cooled and not boxed in, it’s the mechanical noise that’s so annoying. Really up close to the engine the sound level is deafening and as you move away from the noise the level drops. 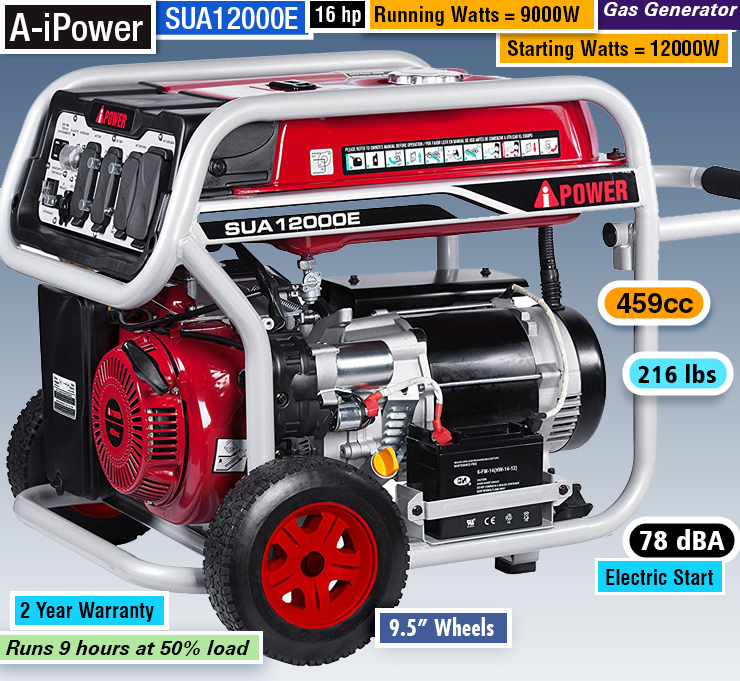 The A-iPower SUA12000E operates at 78dBA at 23 ft. (7m), that’s close to the top limit for big generators. It’s as loud as a gas powered lawn mower at close range. You can reduce the noise by using four ceiling panels to deflect the sound down to the ground. You place four sound absorbing ceiling panels around the machine. The top-ends of the boards must rest against all four sides of the generator with the boards at about 45°. This arrangement will deflect the sound to the ground and absorb some of the noise. It was demonstrated that it can reduce the noise to about the same level as two people chatting. Your neighbors will appreciate it and it’s a quick and easy solution. The engine will still have plenty of air to cool it down due to the four openings left at the corners. Generators are usually put aside and run unattended for hours, even days. If something goes wrong, it can destroy itself in minutes. If the oil level drops to unacceptable levels, the A-iPower SUA12000E generator will shut off before the engine is damaged. It also has a low oil warning light, which is useful when you want to determine why the generator will not start. A-iPower Corp manufacturers the A-iPower SUA12000E. A-iPower stands for American Innovation. Their headquarters are in Ontario, California, the technical and distribution center is in Milwaukee, Wisconsin. A-iPower has developed a reputation for producing some of the most reliable portable generators in the USA. A dual-fuel generator gives you more flexibility when fuel is scarce. The second generator you might want to consider is the Pulsar Products PG10000B16. At 10000W it too is a strong contender for the best big generator. It has the added advantage that it runs on gasoline or LPG. The biggest advantage of using LPG is that you save money. Though LPG is less efficient than gas so the generator loses power on LPG, it will drop from 8000 running Watts to 7000W. Never the less, LPG makes up for that loss of power by being a lot cheaper. Some owners find they use 20% more LPG but still saves about 40% in cash. Prices may be different where you live, so it’s worthwhile checking this out. But, even then, several owners found that using LPG was a great advantage during the Irma hurricane when gas was unavailable. Changing from gas to propane and back is easily done by turning a switch while the machine is running. It’s not as powerful as the SUA12000E. It delivers 8000W continuous power with a short-term peak of 10000W. This means the Pulsar PG10000B16 can handle a short-term overload of 2000 Watts. It will power all the tools listed with the SUA12000E but not all at the same time. You will have to cut back on one tool. If that fits your needs, this generator is for you. Beautiful blue color makes this one of nicer generators you can buy. The Pulsar PG10000B16 is a good strong backup for the home and can be taken on vacation and when tailgating. The Pulsar PG10000B16 has the same power outlet arrangement as the SUA12000E. Combined with a transfer switch, the Pulsar is a solid solution for your home during power outages. It will run all the lights and most of the appliances in your home. You may be disappointed to find that rubber covers do not protect the receptacles. Personally, I consider the receptacle covers as an aid in keeping things clean, but also as an additional safety feature. A small child will not be so easily tempted to put something into it when rubber covers it. Another advantage is that the Pulsar PG10000B16 has two 12V binding post connectors and a lead for charging car and truck batteries. One limitation of the pulsar engine is that it does not have auto shut-off or low oil warning. The disadvantage is that you have to check the oil level at regular intervals. It should only be a problem when running the machine for extended periods. The Pulsar engines have a good reputation and owners rate them very high. This machine has a rugged frame and 9.5” solid wheels for moving it around. I do recommend that you have someone assist you when moving these 209-pound machines over rough terrain. When used with LPG, also remember to first uncouple the regulator from the LPG cylinder before moving the machine. I do not recommend moving it with the cylinder because the connection can be easily damaged. Pulsar Products manufacture the generator, with its headquarters in Ontario, California. With more than 100 years’ experience, they have distribution centers in Ontario and Cary, Illinois. Interestingly, the brand name refers to a natural phenomenon. Pulsars are rotating neutron stars with pulses of radiation at regular intervals. They have very strong magnetic fields, which funnel jets of particles out along the two magnetic poles. These accelerated particles produce very powerful beams of light. When you install or use a generator outdoors, it must be protected from rain, snow, and water. Don’t run it outdoors without protecting the generator and wiring conduit. It can be dangerous but, at least you’re protected because the power will trip if you are at any risk. These big generators weigh approximately 200 lbs. Two or more people should assist when moving or lifting it. Never lift the generator using the engine or alternator lifting lugs. For long-term storage, either drain the fuel into a suitable container or add a fuel preservative/ stabilizer to prevent fuel breakdown. In humid conditions, I also recommend starting the generator once in two months. It will get all the engine oil circulating and it will protect all engine parts against rust.